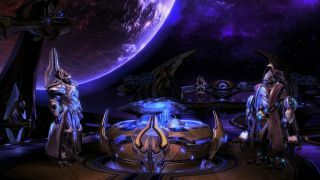 The first episode in a series of new missions for Starcraft 2 arrives March 30. Nova Covert Ops, as the series is dubbed, comprises nine missions across three episodes, each priced $7.50 or available as a pre-order bundle for $15/£12. You take control of Nova, the stealthiest, most fearsome Ghost in the Dominion. Emperor Valerian's rule is under threat and, for some reason, fellow Ghosts have been going MIA. Tracking them down leads to a mysterious Terran group called the Defenders of Man, and you're the lucky operative who gets to unravel the conspiracy. If you like the sound of a short, self-contained set of missions but not the thought of actually paying for Starcraft 2 itself (people are strange, okay? ), you can buy Nova Covert Ops with just the free Starter Edition installed—no expansions required. The series is due to wrap up by December at the latest.